Gas-insulated transmission lines (GIL) are used for high-power extraction from electric power plants and high power delivery to large cities and industrial centers. A large part of a GIL lies above the earth’s surface. In an overhead configuration GIL are subject to climatic factors that affect their transmission, which is determined by the thermal regime. A method for calculating the thermal regime of overhead GIL is developed which takes the influence of climatic factors into account. Calculations for a specific GIL design are presented and analyzed. Translated from Élektricheskie Stantsii, No. 8, August 2018, pp. 31 – 16. V. N. Varivodov, Gas-Insulated High-Voltage Lines [in Russian], http://eepr.ru/article/Gazoizolirovannye_vysokovoltnye_linii. Gas-Insulated Electrical Transmission Lines (GIL). 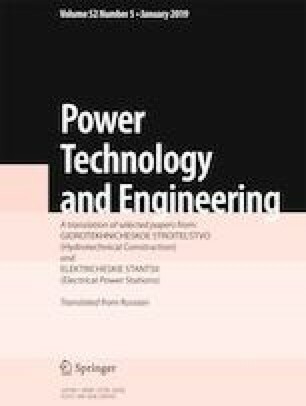 High Power Electrical Energy Transmission [in Russian], http://w3.usa.siemens.com/secmartgrid/us/en/events/Documents/IEEE%202016/TS_Gas-Insulated%20Transmission%20Lines.pdf.